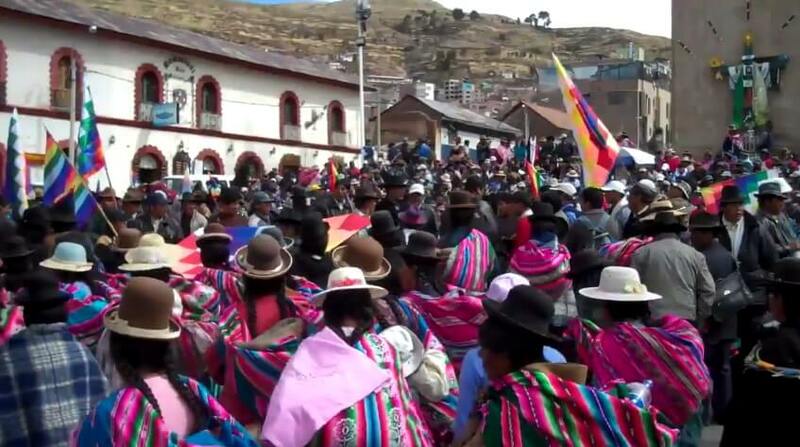 It’s been six years since the socio-environmental conflict known as the ‘Aymarazo’ in Peru, a mobilization that happened in the province of Puno in 2011, against the mining project ‘Santa Ana’, owned by the Canadian company Bear Creek Mining Corporation. The project proposed is an open-cast mine near the border with Bolivia, which had planned to extract more that 63 million ounces of silver over a period of 11 years, beginning in 2012. The local population rejected the project because of the potential exploitation and contamination of water sources in the area, including the important Desaguadero River and Lake Titicaca, which Peru and Bolivia share. As a consequence of the suspending of the project, 18 community leaders are facing criminal charges. They are accused of the alleged crimes of obstruction of public services, disturbing the peace, and aggravated extortion. Among them is Francisca Sarmiento, the only woman leader who is being charged. The public prosecutor is asking for the accused to face 18-28 years of prison and pay over 2 million dollars in compensation. The trial is now in its final stages. This is the reality communities that oppose mining in Peru face – they are criminalized and stigmatized for rejecting mining projects, and in this case, for being Indigenous Peoples. The aggressive pro-mining policies that reign in the country have caused many socio-environmental conflicts in indigenous territories, land dispossession, displacement of communities and the violation of human and collective rights. These policies are pushed by transnational corporations like Bear Creek, which benefit from the extraction of natural resources and the violations of the rights of local communities, communities who are fighting to defend their territories. This is a co-production between The Democracy Center (Leny Olivera Rojas, Sian Cowman, and Aldo Orellana López) and the organization Human Rights and Environment – Puno (DHUMA). DHUMA is part of the organization National Coordination for Human Rights and the Muqui Network in Peru. This article was originally published by Real World Radio. It has been re-published at IC under a Creative Commons License.